It has been a mixed-bag Budget for corporate India and the country's top businessmen. The awaited tax rationalisation has not happened. While the finance minister provided tax incentives for small companies and start-ups, big firms have been burdened with higher liability. New manufacturing companies will now pay corporate income tax of 25 per cent against 30 per cent (plus surcharge and cess) for established companies. Firms with annual turnover not exceeding Rs 5 crore (in FY15) would be taxed at 29 per cent plus surcharge and cess. Bigger companies will have to wait for the next year to see a reduction in their rates. 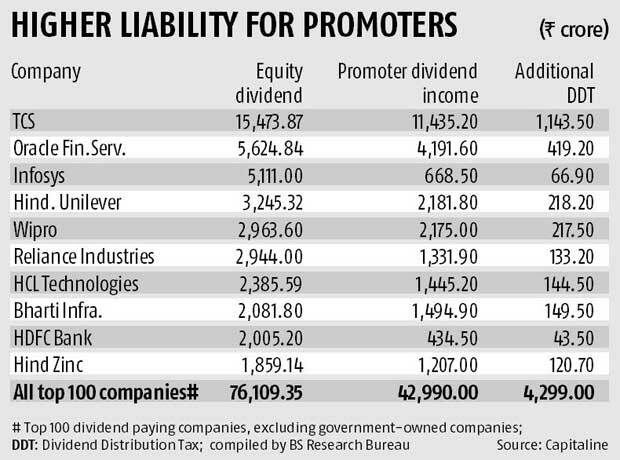 From a promoter's perspective, the biggest development is the additional tax of 10 per cent on gross dividend income exceeding Rs 10 lakh per annum. A rough calculation shows the top private-sector and foreign promoters would be set back by Rs 4,300 crore based on their companies' dividend payment in the past financial year. "The proposal on amounts to multiple layers of taxation. It would discourage long-term investment in equities and large investors would exit from their holdings prior to declaration of dividend and book closure dates. Also, this would create disparity between resident and non-resident investors, as non-resident investors have been kept outside the purview," says Riaz Thingna, director, Grant Thornton Advisory Private Limited. This would also induce promoters to restructure holdings to make these more tax-efficient. The additional dividend tax only applies to individuals, Hindu Undivided Families and partnership firms, including Limited Liability ones. "Many promoters may transfer their holdings to family holding companies and trusts," adds Thingna. The proposal is likely to be tax-neutral for Tata Sons, India's largest business house and holding company in the private sector. The promoter's stake in most group companies is either held through Tata Sons or various family trusts, with little individual shareholding. The proposed 10 per cent dividend distribution tax on dividend income of Rs 10 lakh or more would mean higher personal tax for most of the corporate India promoters. India's top 100 private sector promoters would pay additional income tax of Rs 4,300 crore based on their companies' equity dividend payment in 2015-16. The exact amount of tax liability would depend on the legal structure of their equity holding. As of now, the government only proposes to tax individuals, Hindu Undivided Families and partnership firms including limited liability partnerships. This will spare big holding companies such as Tata Sons, Mahindra & Mahindra, Grasim, Aditya Birla Nuvo, Larsen & Toubro, HDFC and ICICI, among others. The Budget has also tried to tax the fast-growing passenger car sector to fund infrastructure projects. All passenger cars would attract an infrastructure cess. It starts at one per cent for small petrol and compressed natural gas cars, and goes up to four per cent for higher engine capacity diesel vehicles. "It seems the minister is trying to get back a part of the higher allocation on 7th pay commission and one rank 'One pension awards' by raising taxes on the most visible item of consumption in urban areas," says Dhananjay Sinha, head of institutional equity at Emkay Global Financial Services. According to Grant Thornton, this will make passenger cars expensive and hurt demand in the short- to medium-term but long-term impact would be minimal as manufacturers and consumers would adjust to higher taxes. On the positive side, start-ups have been exempted from corporate tax in any of the three of the first five years and there is a three-year tax holiday for developers of affordable housing.